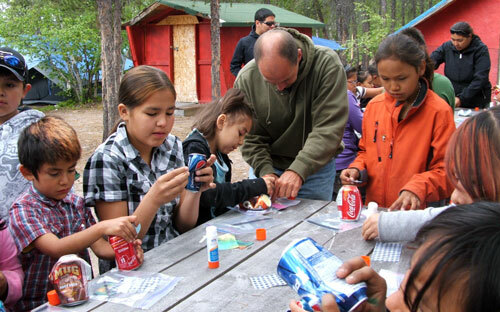 We are an ecumenical, Christian ministry, proclaiming Jesus Christ and serving the church and individuals in remote and isolated areas of Northern Canada. When invited into a community, On Eagle’s Wings offers a ministry of Word and presence. We walk with northern people, listening and learning from each other, as they grow as disciples of Jesus Christ and discover how God is leading them in their community. The needs of each community vary. Most often, though, communities express a desire to have Christian education for children and youth such as Bible Camps, Sunday School, and youth programs. Adults often ask for help with learning how to lead Bible studies, teach Sunday School or run a VBS. On Eagle’s Wings provides resources, curricula, training and mentoring for leadership in these areas. On Eagle's Wings is formally endorsed by the Evangelical Lutheran Church in Canada (ELCIC) It is recognized by the Evangelical Lutheran Church in America (ELCA), with an endorsement and partnership with the Nebraska Synod of the ELCA. On Eagle’s Wings also has established collaborative relationships with the Roman Catholic Diocese of Mackenzie–Fort Smith and with the Anglican Dioceses of Edmonton, Athabasca, and the Arctic.